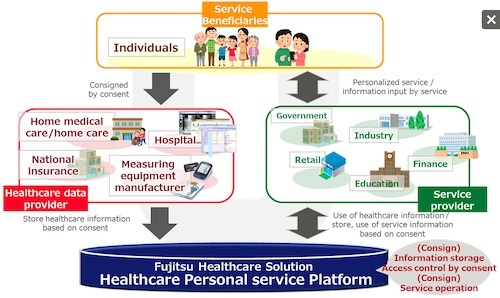 TOKYO, Feb 13, 2019 - (JCN Newswire) - Fujitsu has announced the development of Fujitsu Healthcare Solution Healthcare Personal service Platform, a platform-as-a-service (PaaS) for the integrated management of consumer-facing offerings based on health and medical information. The new service can aggregate and integrate an individual's personal health record(1), enabling the safe and secure storage and use of such health and medical information. Healthcare Personal service Platform is available beginning today. Fujitsu will provide this service based on its accumulated experience and expertise in developing regional healthcare network systems and electronic medical record (EMR) systems, and boasts the largest market share in Japan in these areas. The company developed the new service to enable highly robust data storage and efficient utilization for companies and regional authorities aiming to offer new services by utilizing sensitive personal health and medical information. With this secure PaaS, which includes functionality that ensures consent from individuals and data access controls, Fujitsu is supporting companies and local authorities in using health and medical information entrusted to them by individuals and other sources. Healthcare Personal service Platform, which makes it possible to centrally manage and utilize an individual's healthcare data throughout their lives, accelerates the creation of cross-industry services using health and medical information, including that held by local authorities and pharmacies. The aim of this platform is to realize a society where high added value services, tailored to individuals, are available to support lifestyles that are healthy and fulfilling. In light of Japan's rapidly aging society, the country's government is promoting "data health reform" with the intent of extending healthy life expectancy, and in this way seeks to create an environment in which effective support can be easily obtained so that each and every individual will maintain and manage their health, and prevent illnesses from increasing in severity. Personal data, including medical information, however, is currently stored in a wide variety of locations, but no environment is sufficiently prepared to manage it in an integrated manner. This creates a hurdle to the development of services offered by companies and organizations seeking to provide services to individuals. Anticipating the use of personal data, which includes medical information, Fujitsu in 2013 began a research project regarding the platform for managing health and medical information. The company is undertaking initiatives to promote healthy living and personalize medicine through the use of ICT, and started to develop a practical healthcare ICT platform in 2015 that integrated information from the fields of medicine, caregiving, and health. Fujitsu also utilized its strengths, the expertise it possesses in an array of industries, to conduct field trials with organizations such as regional authorities and pharmacies, to create cross-industry services using health and medical information. As one healthcare ICT platform, Fujitsu will work through this service to offer a way that enables an individual's data to be managed and utilized safely and securely in the form of personal health records. In using individual data, it is necessary to control data access, including by family members, with the consent of the individual. This product has consent management and user management functionality, including for third parties such as family members, providing access control between registered users. The platform also includes as standard user management functionality that enables data access control by showing the relationships between users, such as between doctors and patients or parents and children, in addition to the users' relationships with their families. This makes it possible for only those an individual has authorized to access information. This platform offers data management and operations with guaranteed security, supporting the several hundred regulation items cloud businesses must follow when handling healthcare information. Such relevant guidelines relating to healthcare information systems are established by MHLW (Guidelines for the Safe Management of Medical Information Systems, 5th Edition), the Ministry of Economy, Trade and Industry (Safety Management Guidelines for Information Processing Businesses Handling Healthcare Information on Behalf of Others), and the Ministry of Internal Affairs and Communications (Guidelines Relating to Safety Management When Cloud Service Businesses are Handling Healthcare Information, 1st Edition). Taking advantage of Fujitsu's experience with developing and operating healthcare systems for over 30 years, the platform also features security policies necessary for handling healthcare information, as well as standardized technology and insights from the healthcare industry, in order to promote data circulation. Furthermore, by adopting the international standard ID-WSF(2) for its interlink format, the platform guarantees the safety necessary for exchanging sensitive healthcare information. To promote the use of data in personal health records, Fujitsu has leveraged its strength as the leading provider of EMR systems with the largest market share in Japan. The new platform is indeed equipped with standard data usage API predicated on connecting with back-end systems such as Fujitsu's EMR system (the Fujitsu Healthcare Solution HOPE LifeMark series) and regional healthcare network system (Fujitsu Healthcare Solution HumanBridge EHR), to advance the use of medical information. In addition, tools to improve development efficiency for data usage services linked with back-end systems, such as the API, are included as standard offerings. Going forward, Fujitsu plans to expand linkages with back-end system, in order to handle an even broader range of data. (1) Personal health records Personal records that collect and manage information relating to a person's health. Individuals can control the disclosure of the records on their own volition. (2) ID-WSF Identity Web Services Framework. A specification for web services that provide functionality such as single sign on (SSO), defined by the Liberty Alliance. It defines the data model and processes for safely circulating user attribute information between websites.